Emergency Dangerous : Fire Fighter by Triple Play Co., Ltd. !!!!!!! ON SALE NOW (50% OFF) – INTRODUCTORY PRICE !!!!!! Get it now while on SALE! The Mad Orc team has squeezed every drop of juice from their brains to come up with this innovative action oriented time management game that has never been made before!!! The world is in grave danger! Emergency signals are broadcasted in every radio station announcing that the situation is out of control! It is TIME to reach EMERGENCY DANGEROUS with your iPhone and iPod and save the WORLD!!! 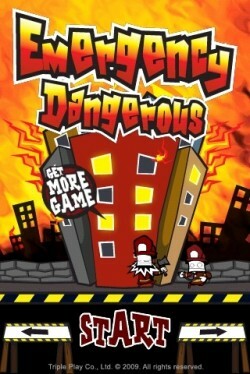 You can now have the chance to manage the team of fire fighting experts called EMERGENCY DANGEROUS! With your help and fire fighting expertise, they can rescue people all around the world who are in danger! 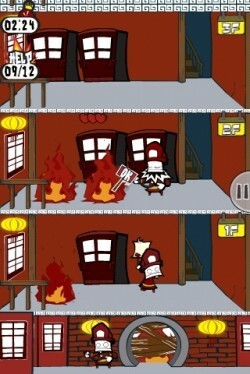 Assign your team to different tasks in order to save the victims trapped in the burning buildings. Use the money you earn after each mission to upgrade your equipment and add more fire fighters to your team! Unique time management game! Douse out fires and barrage through doors to rescue and heal fire victims! There’s no time to waste, start saving the world NOW! Be a HERO!!! !! !Highly recommended for fans of Time Management Games!!!! - Play through over 20 missions around the globe! - Cute, smooth, and stylish cartoon style graphics with generous animations! - Engaging music and sound effects composed by professional musicians! - 12 Beautiful trophies to collect! - 20 equipment upgrades to buy! - All original voice overs by professional actors/actress! - More fun game modes! - More trophies to collect! - More countries to rescue! - More life saving missions! - Global High score Rankings! OTHER GAMES FROM TRIPLE PLAY! Special Thank to Delirium211 for very nice game description!